The mystery of the fate of the 1845-48 British Arctic Expedition to find a route through the Northwest Passage has sparked morbid fascination ever since search parties returned to England with tales of desperation, illness and cannibalism. Countless expeditions to find answers, culminating in the discovery of the ships HMS Erebus and HMS Terror in 2014 and 2016 respectively, have brought back tantalizing pieces of the puzzle, but the question of what exactly happened to Sir John Franklin and his men still remains. Now, The Terror, a new AMC series adapted from the 2007 novel by Dan Simmons, will weave true events with fiction to offer an answer to the Franklin saga. The haunting 10-episode anthology series from executive producers David Kajganich, Soo Hugh and Ridley Scott explores the crew’s desperate game of survival as they fight against the elements, isolation and the unknown. Canadian Geographic talked to Kajganich about the series, which premieres March 26 on AMC. One of the things that was such a joy about doing this show is having been obsessed with this history and getting a chance to basically throw a big party — a rather morbid party as it turns out. The show has the spirit of a re-enactment down to the closest detail we could manage. When people watch a show that’s based on a novel like this, I want them to feel something of what I felt when I read the story for the first time. We really tried to honour the tone of the book, which is such a wonderful hybrid of genres: part high adventure story, part gothic horror story. One thing I tried to translate into the script was how the world feels larger than life, in the way that I think any kind of exploration must feel. The crew of the Franklin expedition signed up for a discovery service voyage. They wanted to go into this unknown place and experience something that Europeans had not experienced before, and we wanted the show to feel like that. So when viewers look out over the ice, it feels epic, and when they look up and see the aurora borealis, it feels mystical. I think everyone understood that Simmons' book was a real triumph and a rarity, because it incorporated these amazing characters from real history into something quite frightening. The show is different from the book in the way that Game of Thrones and The Walking Dead step away from their books sometimes. For one thing, we had the benefit of some additional insight that Dan didn’t have when he wrote the book, including the discoveries of the ships. The biggest insight that came out of where Erebus and Terror were found was that they didn’t find them where they expected to, so the question becomes: did the ocean currents carry the ships to those locations and do we assume they were unmanned at that point? Or do we assume that they were piloted to those positions? I think the latter theory is commonly accepted now. We had four writers, a dedicated researcher and a couple of assistants all working on the show. We were cramming like grad students the whole time. We were reading Trollope and Dickens and George Eliot, trying to get a feel for the language of the Victorian era. We read Russell Potter and Ken McGoogan and all the seminal historians that have addressed the history of the Franklin expedition. We read first-person accounts of exploration, like The Arctic Journals of John Rae. Luckily, where the captains are concerned and some of the officers, we had some pretty fantastic biographies to work from. We also owe a huge thank you to Dan Simmons for the amount of research he did for his novel. As we spent weeks adapting this story, the thing that was most important to us was that it be character driven. Franklin (played by Ciarán Hinds) is a controversial figure in particular. How much responsibility for what happened do you lay at his feet? We tried to make sure that when we made inferences between historical facts about these characters, they were always in service to a kind of larger allegory we felt we were telling about the period. It’s fascinating work, and it’s work that has quite a lot of responsibility, because these people were alive. They have relatives still alive, they have people invested in making sure that their hard work and sacrifices are remembered. Our goal as writers and filmmakers was to make sure that even if you don’t agree with the decisions that were made, you understand that they weren’t made carelessly. In the same way that everyone has a different sense of humour, I think people have different senses of horror too. We wanted to make sure that the show employed a lot of different kinds of horror, but one rule we had from the outset is that we didn’t want to have any jump scares in the show. Some people love it; I don’t happen to. We wanted the tension in the show to come from the audience getting to know these characters better every episode and having to be with them when they start to make increasingly upsetting decisions in order to survive. And when the characters make noble or moral choices, we wanted those to feel like victories in this context. The Terror is a story about a British Royal Naval expedition traveling through the high Arctic, which brings them into direct contact with Inuit characters who emerge from the landscape not as passive or ornamental features of it, but as representatives of an equally complex and relevant culture. We put enormous care into trying to be as authentic to the Netsilik culture we are portraying as possible. 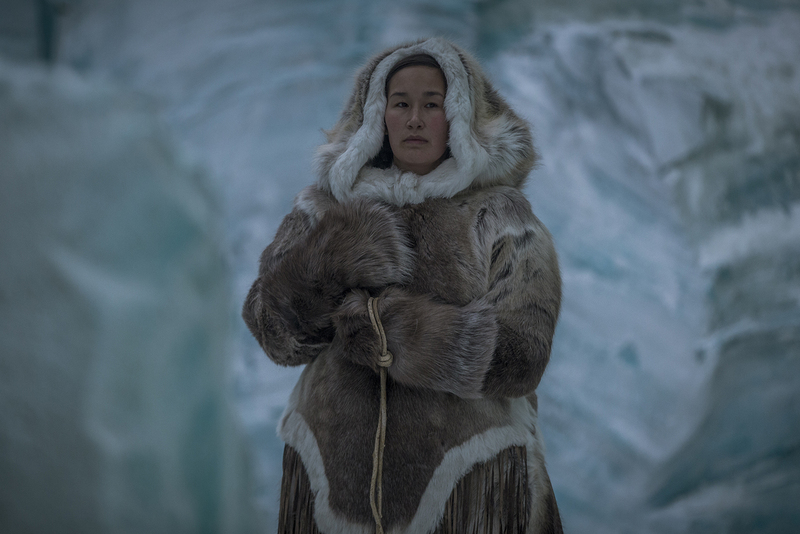 We kept a constant dialogue open with our Inuit collaborators and advisors to help us hone and revise anything in the show that needed attention, and our four lead Inuit roles are played by Inuit actors — three of them from Nunavut, where the show is set. 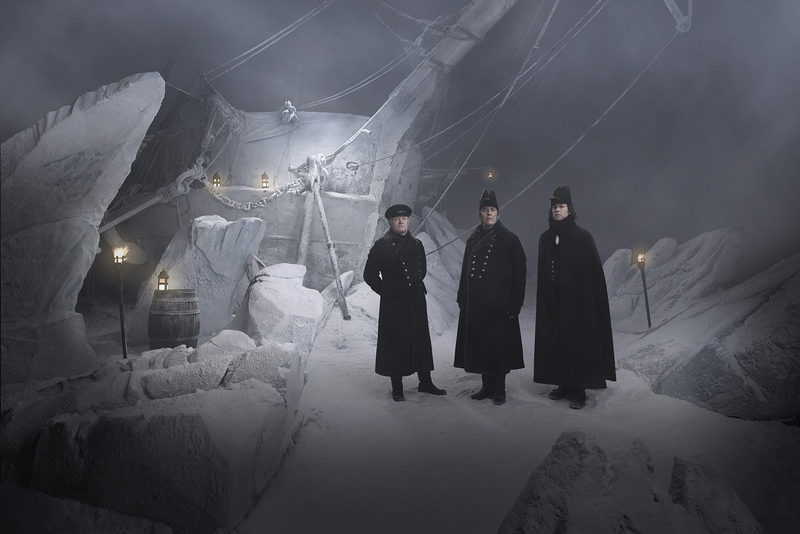 The two-hour premiere of The Terror airs on AMC on March 26 at 9/8 ET/PT. Follow along with the series as Franklin historian Russell Potter and writer Stephen Smith review each episode on cangeo.ca. The doomed 1845-1848 British Arctic Expedition commanded by Sir John Franklin has inspired its own literary subgenere, from Lord Tennyson and Margaret Atwood, to Sten Nadolny, Mordecai Richler, Sheenagh Pugh, and William T. Vollmann. Now best-selling American novelist Dan Simmons has produced a haunting, masterful, and ultimately poignant narrative of the expedition. The result — drawn from the real-life minutiae of the disaster, including the "poisons in the Golden tins" — is, as was once written of the Franklin expedition itself, a fate as terrible as the mind can conceive. Of all the terrors of the labyrinthine archipelago of northern Canada, and the illusory terrors of a malevolent supernatural creature of the ice, it is something human that proves to be the most terrifying thing of all.